Provides an analog type display in a digital environment. The digitally enhanced analog display provides a clean, easy to read presentation that can be held on the screen for as long as the user desires. Display provides specific information as to the location of the echoes of interest. For thickness measurements, distance is also given numerically. Microprocessor-based design provides wide flexibility in operating features. Combines many features in an easy to use instrument. Pregnancy detection in mammals ranging in body size from large rabbits and foxes to cattle and horses. Backfat thickness measurement (in mm or inches) for animals having one, two, or three layers of backfat. Loin muscle thickness measurement (in mm or inches). 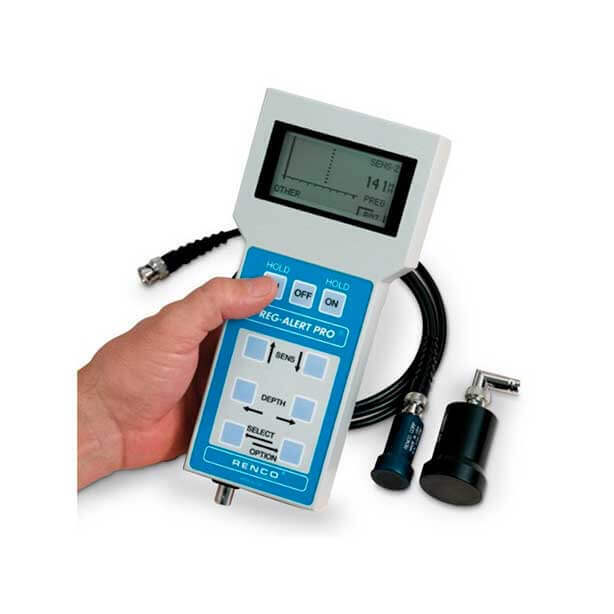 Uses the appropriate speed of sound factor when measuring fat or muscle. Also measures the thickness of certain other tissues, such as breast thickness in poultry and blubber thickness in some aquatic animals, e.g. the Harbour Porpoise. The testing process is totally non-invasive, minimizing the chance of infection and disease transmission. in those animals where this occurs, which take place very early in the pregnancy cycle. the far side of the intrauterine wall. By detecting the echoes from the fetus(es). When measuring thickness, the user can restrict the maximum screen depth displayed in order to avoid spurious and non-meaningful data beyond the region of interest. Once a reading is obtained, one of the HOLD keys can be pressed to keep the reading on the screen until the key is pressed again to release it. The screen is backlit to aid in low visibility environments. The instrument is a small handheld device powered from 4 disposable size AA cells. It is made from high impact plastic and though not waterproof, it is shielded to conform to all current applicable standards for electronic immunity and emissions. It is designed to withstand adverse environmental conditions, normally associated with animal production.